All our lives we've been told that games are distractions — playful pastimes, but unrelated to success. In Game Frame, Aaron Dignan shows us that the opposite is true: games produce peak learning conditions and accelerated achievement. 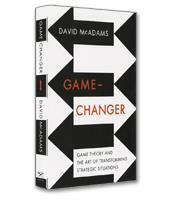 Game Frame is the first prescriptive explanation of what games mean to us, the human psychology behind their magnetic pull, and how we can use the lessons they teach as a framework to achieve our potential in business and beyond. As we grow older, we are taught that games are distractions, a playful break from serious activities. Thirty-something consultant Aaron Dignan, part of a generation that has been raised on constantly changing games and gadgets, disagrees. 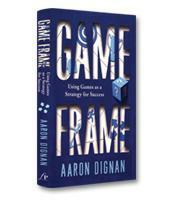 In Game Frame: Using Games as a Strategy for Success, Dignan persuasively argues that games can lead the way to success, achievement and fulfillment in business and in life. Rather than being time-wasters, Dignan writes, games can offer opportunities to resolve two basic issues that undermine our efforts to achieve: lack of volition (I don't want to do it) and lack of faculty (I don't know how to do it). With lack of volition, people are unmotivated, disinterested and disconnected, Dignan writes. They don't see the value in an activity or behavior. They refuse to become involved. Games address lack of volition because they are designed to engage people, to interest them, and to offer the promise of fun and excitement. Games also offer autonomy and control, Dignan notes. When you play a game, you are in charge. What happens depends on you. Fun, control, autonomy — these are the types of elements that engage and motivate people. Games also put us in a learning mode, Dignan writes. When you first play a game, you are not very good. You make mistakes. The more you play the game, the better you become. Eventually, you master the game and are ready to move on to the next level. Dignan quotes game designer Raph Koster, who uses the term "grok" when talking about the game learning process. "To grok something," Dignan explains, "means to understand it so thoroughly that it becomes a part of you." Grokking applies to the workplace, too. For example, a cashier who has been on the job for five years probably knows everything there is to know about the job. The problem is that once you've grokked something, you become bored. There is no more learning or discovery involved. In his seminal book, Flow, author and professor Mihaly Csikszentmihalyi illuminates why games are so attractive, Dignan writes. Csikszentmihalyi shows that people are most effective and happy when they have the exact right level of skills to meet the challenges they face. If they don't have enough skills, they will be anxious. If their skill level is above the challenge, they will be bored. To progress in an activity, people need to have challenges that are just beyond the level of their skills and abilities. They will be motivated to grow just a bit to enjoy the perfect balance of skill and challenge, which gives them a feeling of exhilaration and achievement. Games, notes Dignan, "provide us with what we crave: a set of escalating challenges, feedback on our progress and the thrill of victory." In 10 chapters (called levels, an echo of the learning process of a game), Dignan explores the multifaceted implications of games in today's society. 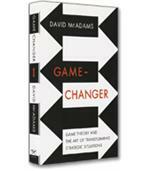 Topics include the rise of interactive technology, the misunderstood concept of play and the future of games. In one chapter, Dignan shows readers how to design behavioral games for success based on 10 building blocks, among them: objectives, skills, resistance (the opposing force that creates tension in the game), resources, actions, feedback (some kind of response to the action taken) and outcomes. Game Frame is a unique and insightful read. Dignan not only successfully advocates on behalf of games, he offers his readers an actionable tool for designing games that readers will want to use for the next major challenge that they face.